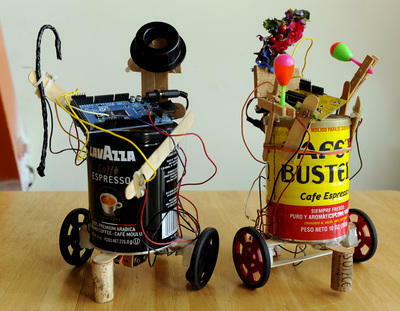 Teach Me To Make teaches art and technology using a hands-on tinkering approach. Teach Me To Make is always available for consulting and for private individual and group classes in electronics, electromechanics, and other creative technologies to meet your needs. Michael and Judy will be teaching Arudino workshops in the Arduino tent at the San Mateo Maker Faire. Teach Me To Make was featured in an article on Arduino in the Contra Costa Times. Page 1 and page 2 of the print version, which is slightly different from the online version. Arduino with a Wood & Nail Breadboard as part of the post-Maker Faire Workshop Weekend, at Tech Liminal in Oakland. Basic Electronics/Arduino Workshop at the California College of the Arts, San Francisco campus. I can try. What are you trying to do, and where are you having trouble? Hey michel, I want to make a circuit using ldr(light dependent resistor) such that whenever light does not fall on the ldr, the 12v motor should start and when light falls on it, the motor should stop. Maybe a phototransistor be replaced to Ldr. I tried a circuit with bc547 transistor but the transistor was burned out due to high voltage. Can you please help me in making this circuit. There are many ways to approach such a project. The individual values for the resistors depend a lot on the specific LDR and the ambient light. A quick Google for relevant terms should turn up some circuits. As to why your transistor failed, I doubt it was the voltage – most of it is current that damages transistors. (although certainly the higher the voltage the higher the current.) If you provide the circuit that you used I might point out what might have gone wrong.